After over two years of waiting, Luton will finally see their application for a 17,500 stadium at Power Court go before a development control committee at Luton Town Hall this evening. The club was buoyed by a report by planning officers which recommended approval be granted for the scheme last week. 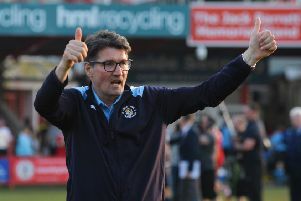 If an endorsement follows, it would be an historic decision to grant the first ever permission for Town to build a new stadium after more than 60 years of trying to move from their current home of Kenilworth Road. The Power Court proposal has plenty of other facilities, including a music venue, bars, restaurants, leisure and entertainment facilities, plus a new enhanced public piazza meeting space. Power Court is the first of two planning applications submitted by 2020 Developments – the property arm of the Hatters – with Newlands Park, by junction 10 of the M1 motorway, set to be determined on January 30. Combined, both applications would boost the local economy by more than £250million a year and create 10,000 new jobs. Such is the anticipation for tonight’s meeting that the council is taking the unusual step of streaming the development control committee meeting live on their Facebook channel, due to the limited capacity of the Town Hall Chamber. The chairman of #saveourtown, Nigel Green, said: “Whichever way our elected councillors choose to vote tonight on the planning application for Power Court, it will be an historic day where the verdict will reverberate around Luton for generations to come. “To turn it down will be devastating for Luton. But, to follow the planning officer’s recommendation and grant approval, will be a vote to save our town from stagnation and decline. “It will be a once-in-a-lifetime vote for major transformation. It will be a vote for the progress Lutonians want and deserve. “And above all it will be a vote to afford our children a bright new future, growing up in a town that they can be proud of.